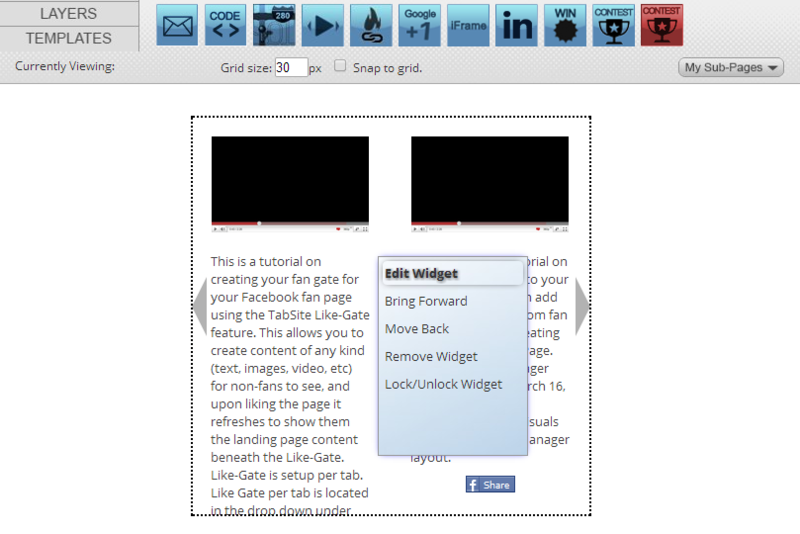 The VideoShow widget provides the ability to add a series of YouTube videos in a slideshow format to your page. This widget allows you to have an unlimited number of YouTube videos with descriptions, Facebook Share, and on-page playing of the videos. Enter the YouTube video ID. If you are not sure what the ID is, paste the URL in the the field provided and TabSite will extract the ID for you. If you would like to add a description to the video, enter it in the field provided or click on the "use YouTube desctiption" to have TabSite automatically pull the description from your YouTube video page. The Share Title is the title that will appear on someone's wall when they share your video with their friends. You can also add a Share Description in the field provided. 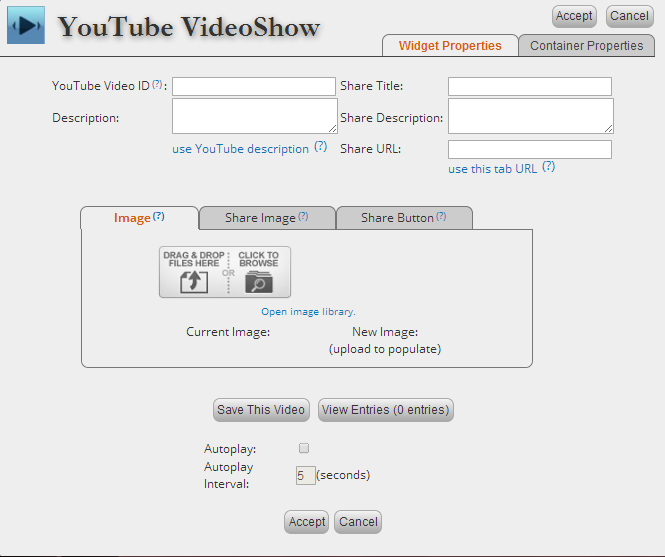 The Share URL is where you would enter the URL of where you want viewers to go to when they click on your shared video. To have it link directly to your TabSite, click on "use this tab URL." Please note that you can only link to a top-level tab and not sub-tabs. To add a custom preview image, either choose an image from your image tray or upload a new image by dragging it to the Drag to Upload box. Do the same for the Share Image if you would like to add a custom image there, also. Ther Share Image is what viewers will see when your video is shared on a Timeline. If you would like to use a custom Share Button, follow the same steps as you would when adding a custom Image or Share Image. Once you have all of the information for your video entered, click on the Save This Video button. To view the videos that you have saved to your VideoShwo, click on the View Entries button. From here you can edit and remove previous added videos or rearrange the videos by simply clicking and dragging. To go back to the previous screen, click on Add New Entry. To have the VideoShow start playing as soon as someone views the tab, click on the Autoplay button and then designate how many seconds to wait between videos in the Autoplay Interval field. When you are finished, click Accept. It will show your widget similar to this below. You can edit the widget by right clicking inside your widget window.